To easily snag a home loan, an applicant needs to be a "triple threat" -- have an excellent credit rating, a large down payment, and low debt-to-income ratio with steady significant income. But even if you have bad credit, you don't have to rule out future home ownership. Homebuyers with bad credit due to a foreclosure or bankruptcy, or who have previously been turned down for a loan, can still get a home loan. Melanye Miller, a 40-something Chicago schoolteacher, has been hankering for three years to move out of the single-family home she was renting, so that she could purchase a place big enough for her and her three children. But when her credit report revealed a poor score, she knew banks would not give her a home loan, especially not one with zero down payment. To increase her chances of getting a home loan, Miller began a long road to recovery from her bad credit history, which included not using credit cards and setting aside money each month for her house fund. Finally, in November, after saving for almost two years, she purchased a four-bedroom condo. "I saved and saved, but I decided to purchase a foreclosure condo because it was less expensive and required fewer funds," she says. 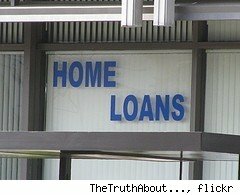 "Owning a home is not out of the question if you have bad credit. You just have to do your research, know what you can really afford, do even more research, and save your money." There are hurdles, for sure. But for those with a less than stellar credit history, you need to highlight your "compensating factors" -- those mitigating factors not reflected in your bad credit score or on your credit report. Even though there are few opportunities for personal appeals when applying for a home loan -- for instance, explaining why a bill was not paid on time -- you can still try to present yourself in the best possible light. It just may help tip the scales in your favor when you've got bad credit in your history. 1. Flaunt other assets. If you don't have a large cash reserve or a large down payment, show loan officers the financial assets you do have. For example, if you have whole life insurance, list the cash value on your home loan application. If you have a sizable 401(k) or other retirement accounts, be sure to list them all and their current values. This strategy lets lenders know that if you're ever in a bind paying your mortgage, you're able to pull from one of these other sources to make ends meet. And if you're seeking to refinance, showing a low loan-to-value rating is a huge plus. 2. Stress job stability. If you have been working in the same industry for several years, and even with the same company for, say, five years or longer, be sure to highlight that to offset a bad credit history. And don't forget to mention any regular pay raises that you've received. If you have a cost-of-living increase every two years, or an annual merit-pay increase, be sure to mention in your home loan application how your income has risen over the years. The same goes for regular bonuses. Proof of rising pay or additional money will help lenders know that you will have funds to offset any possible rise in expenditures, such as property taxes or utilities. 3. Show discipline. Prove to lenders that your bad credit is a thing of the past and that you know how to save. If you've been socking away $600 a month to a savings account or have been contributing yearly to a retirement account, this will help you obtain a home loan. You are trying to show discipline, consistency and stability. 4. Willingness to stay put. Prove to lenders that you're not a flight risk. Home loan lenders like to believe that you're going to stay put in that home for some time (though you can always upgrade or downsize). Show that you're committed to the home, neighborhood or greater community by listing how long you lived at your last residence, if the length of time was significant -- three years or more. If that time was spent living in your mother's basement, that might not fly, unless you show that the home you're interested in is down the street from Mom. Strong ties to the community can help. 5. Increase your down payment. The days of zero down payments are pretty much gone. Yes, you can get a house with a 10 percent down payment, or 3.5 percent under FHA. But in general, the larger the down payment, the quicker the home loan approval. Historically, the single largest obstacle to purchasing a home has been amassing enough money for the down payment and closing costs. If you can't come up with that money on your own, there are a few down-payment assistance programs as well as state and local municipality programs to help. Check with your city for possible homebuyer assistance; show your banker that you're not afraid to ask for help and that you have the tenacity to solve any of your own financial problems. 6. Don't bite off more than you can chew. Be reasonable about the amount of house and home loan you can afford, even if some real estate agents or brokers are telling you that you can afford more. The best advice is to start out smaller than you want. Spend some time getting to know home prices in the area where you want to buy, and know that you always can move up later. It's far better to own a home you can afford than to move into something outside your payment comfort level -- only to lose it and amass more bad credit down the road. 7. Have proof. It's one thing to tell potential home loan lenders that you never were late on your rent, or that you always pay your child support obligations. It's another thing to be able to show them. Be prepared to give documentation to back up all of the items on your compensating factors list. For example, show canceled checks for payments you've made to any entity, show bank statements to prove regular deposits of income or contributions to retirement. A letter from a landlord saying that you paid rent on time is not enough. If you cannot produce these documents, you will raise doubts about the veracity of your credit history. The bottom line is there are certain red flags that give home loan lenders pause. When your credit history is less than perfect, get past the warning signs by highlighting other, positive aspects of your financial profile. Article by: Sheree R. Curry, an award-winning journalist, writes about personal finance and real estate. Her work has appeared in Fortune, the Wall Street Journal, theStreet.com, Entrepreneur, People and HousingWatch.com, among others. Really what a wonder full writer.I really enjoy it offcourse it helps me alot on my several doubts regarding Home Loan.Please Continue these types of sharing and honestlty very thankful for this sharing.